Say what you will about statement tees—in a world absolutely overloaded with mixed messages, maybe the time is right now to wear your heart on your sleeve. Or, in the case of Balenciaga, Stella McCartney and Prabal Gurung, wear your charity across your chest. More than just a statement splashed across cotton, a whole lot of labels, movements and organisations have recognised the need to properly invest in positive change. While fashion isn’t known for its green credentials, sustainability, fair work or body positivity—a few of our favourite designers are working hard to reverse the damage and send a different cue to the world that wears their logos. Balenciaga’s FW 18 runway show earlier this year set the tone: a Berlin Wall type structure was splashed with neon tags, peace signs and gay pride emblems. Creative Director Demna Gvasalia sent men and women down the catwalk together as equally appealing agents of change, sporting 90s-style World Food Programme merch. The branded tees, caps, bags and hoodies are a part of a real partnership between Balenciaga and the United Nations charity to support their mission of ending world hunger by 2030. From September 6, 2018, to February 1, 2019, Balenciaga will donate 10% of the suggested retail price from its Winter 18 WFP-branded products to the World Food Programme. In addition to this, Balenciaga has already donated US$250,000 to support the WFP in its mission to save lives and change lives around the world. So while the powers that be may be letting the team down on serious world issues and flooding your feeds with negative ideas, your t-shirts don’t have to play the same creepy mind games. Of course, you can always give directly to a charity or cause that resonates with you, but so long as we're all chasing cool tees, you may as well make it a more mindful style moment. Yep, fashion’s getting more meaningful, and I'm all about it. Here are five tees to shop that are giving back, healing the world and championing real change right now. 1. EDITOR'S PICK: This oversized crewneck tee from HoMie—a super cool initiative launched in Melbourne to help people experiencing homelessness in Australia. Best part? 100% of the proceeds go directly to the cause. $65 at HoMie. 2. Make like Khalid with this collector's item. 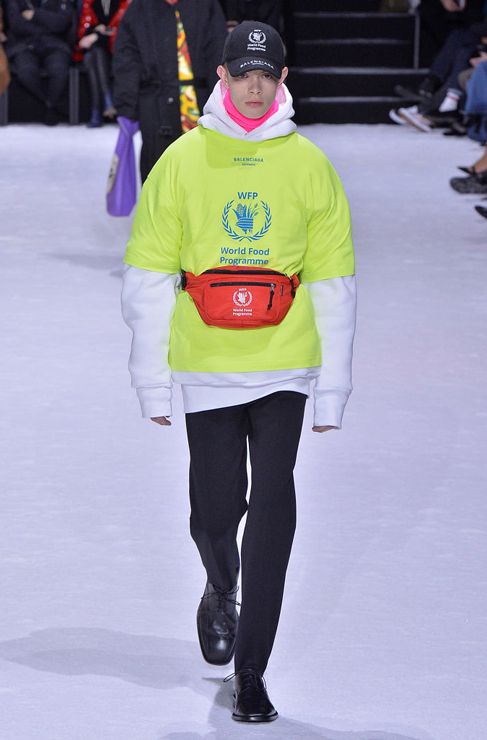 The aforementioned Balenciaga World Food Programme collection features splashes of neon yellow, so you can tick off that massive trend while also helping to address the heartbreaking issue of world hunger. $530 at Balenciaga. 3. The Nope Sisters know a t-shirt can't change the world. But the Wellington-based company hopes a simple statement tee might empower someone in a moment, change a viewpoint or just share something good. 25% of profits from their 'NOPE Means NO' collection go straight to their partner charity, the Sexual Abuse HELP Foundation in Wellington. $40 at Nope Sisters. 4. Stella McCartney's 2018 International Women's Day t-shirt was a collab with Net-A-Porter with 100% of the profits going to Women for Women, a charity empowering marginalised women around the world. $265.18 at Net-A-Porter. 5. Nepalese-American immigrant designer Prabal Gurung's love for spreading good messages on cotton has seen him support Planned Parenthood in the States and Shikshya Foundation in Nepal. The finale of his FW 18 runway show was packed with heartfelt, powerful feminist slogans. Proceeds from this pink heart long sleeve t-shirt are donated to the American Civil Liberties Union and the Shikshya Foundation. Approx. $415 at Prabal Gurung. While you're here, take a look at Virgil Abloh's debut Louis Vuitton collection.